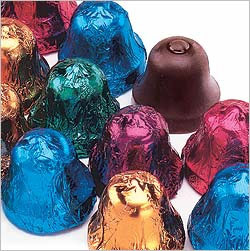 Highly detailed dark chocolate molded bells, wrapped in jewel-tone foils. An ideal addition to any fabric or wooden Advent calendar. Also great for stocking stuffers, place settings, party favors, gift tie-ons and holiday candy dishes. Approximately 7.0 oz. total chocolate. This item does not contain peanuts or tree nuts as ingredients, but is manufactured on equipment that processes peanuts and tree nuts (Almonds, Pecans, Cashews and Hazelnuts). This item contains milk and soy.